It has been an entire generation since nuclear power was seriously considered as an energy option in the U.S. It seems to have been forgotten that the reason U.S. utilities stopped ordering nuclear power plants was their conclusion that nuclear power’s business risks and costs proved excessive. With global warming concerns now taking traditional coal plants off the table, U.S. utilities are risk averse to rely solely on natural gas for new generation. Many U.S. utilities are diversifying through a combination of aggressive load reduction incentives to customers, better grid management, and a mixture of renewable energy sources supplying zero-fuel-cost kWh’s, backed by the KW capacity of natural gas turbines where needed. Some U.S. utilities, primarily in the South, often have less aggressive load reduction programs, and view their region as deficient in renewable energy resources. These utilities are now exploring new nuclear power. Estimates for new nuclear power place these facilities among the costliest private projects ever undertaken. 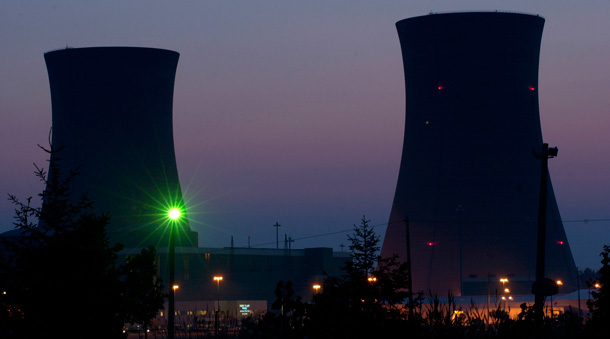 Utilities promoting new nuclear power assert it is their least costly option. However, independent studies have concluded new nuclear power is not economically competitive. Given this discrepancy, nuclear’s history of cost overruns, and the fact new generation designs have never been constructed any where, there is a major business risk nuclear power will be more costly than projected. Recent construction cost estimates imply capital costs/kWh (not counting operation or fuel costs) from 17-22 cents/kWh when the nuclear facilities come on-line. Another major business risk is nuclear’s history of construction delays. Delays would run costs higher, risking funding shortfalls. The strain on cash flow is expected to degrade credit ratings. Generation costs/kWh for new nuclear (including fuel & O&M but not distribution to customers) are likely to be from 25 – 30 cents/kWh. This high cost may destroy the very demand the plant was built to serve. High electric rates may seriously impact utility customers and make nuclear utilities’ service areas noncompetitive with other regions of the U.S. which are developing lower-cost electricity. I am not saying here that nuclear power will play no role in the fight to stay below 450 ppm of atmospheric CO2 concentrations and avoid catastrophic climate outcomes. Indeed, I have been including a full wedge of nuclear in my 12 to 14 wedges “solution” to global warming here. It may, however, be time to reconsider that, since it is increasingly clear achieving even one wedge of nuclear will be a very time-consuming and expensive proposition, probably costing $6 trillion to $8 trillion and sharply driving up electricity prices. Given the myriad low-carbon, much lower-cost alternatives to nuclear power available today—such as efficiency, wind, solar thermal baseload, solar PV, geothermal, and recycled energy (see “An introduction to the core climate solutions”)—the burden is on the nuclear industry to provide its own detailed, public cost estimates that it is prepared to stand behind in public utility commission hearings. Even when no effort to conceal information is apparent, the very terminology used when projections are presented can be confusing or misleading. For instance, in 2007 when a number of new nuclear proposals began to advance, it was common for “Overnight Cost” estimates to be quoted. For a project (such as solar or wind) whose construction period may be as short as several months, the difference between an “overnight” cost and the full cost to complete the project may not be significant. However, for a nuclear project that may typically take a decade to complete, cost escalations that occur during this long construction period, plus the financing costs during construction, may easily double the total cost of a project compared to its “overnight” cost. When the full picture is presented, some may perceive the total cost estimate has mysteriously doubled. However, it simply should have been stated clearly to begin with that major escalation and financing costs cannot be avoided when it takes a long time to complete a project. Failure to do so is tantamount to selling someone a house with “teaser” initial mortgage payments and failing to make clear that the mortgage payments will later reset to a much higher level. Another mysterious “black box” presentation method is to fold the overall costs of the new facility into the general rate base of the utility, without ever mentioning what the generation costs per kWh of the nuclear unit will be. Instead, it is often only presented how total costs per kWh for all ratepayers will increase—which includes kWh’s generated by existing generation units. (For instance, if a nuclear unit is to supply 20% of the kWh’s for the utility when it comes on line, any cost increase per kWh appears to only be 1/5 as large because the additional costs are also spread over the 80% of kWh’s generated by other facilities, even though those other facilities did not cause the rate increase.) While it is important to know the impact on final overall retail electric rates, it is also important to know the generation costs per kWh from the nuclear facility. If this step is “skipped” in public presentations, the nuclear units (or any new generation power source that is more expensive than existing units) can appear far cheaper than their real impact. The Paper takes the approach that it is best to lay out in detail “how you got that number” at each step of the way. All parties can then proceed to have discussions based upon real numbers rather than mysterious “Black Box” secrets. So feel free to criticize the analysis, but anyone offering different all-in cost estimates for power from new nuclear plants should detail their own assumptions and calculation. And simply pointing to the operating costs of existing paid-off nuclear plants doesn’t count as detailed analysis—my home would be very cheap to live in if I didn’t have a mortgage. Also, it’s fine to call for aggressively developing fourth generation nuclear plants (as James Hansen does)—I’m all for such R&D—but that won’t help us meet 2020 climate targets, and probably won’t help us significantly meet 2030 targets. In any case, it is impossible to accurately project the real world all-in costs of noncommercial technologies that are still largely sitting on the drawing board.